Editors Note: It’s not my area of expertise being male so I got a friend of mine who knows much more on the subject to write this but she wanted to remain anonymous. But big thanks to her! One of the most difficult parts of the day when you are pregnant is bedtime. Your back aches, your belly feels like it will burst, your bladder is being pushed and you just want a hug, but your partner is sleeping. When you are moving around during the day, as uncomfortable as you may feel, the worst is at night when you are desperate for sleep and just can’t find a good position. The best thing you can do for yourself, and your partner for that matter, is to get a great pregnancy pillow. Without a pregnancy pillow, most pregnant women wake up with an aching back, aching hips, neck and even knees. With their belly resting against the bed and their body weight pushing down on it, many women end up having to get up to use the loo many times during the night because of the pressure on their bladder. Instead, sleeping with a pregnancy pillow will have you waking up refreshed and rested. Important since soon, even the most comfortable pregnancy pillow in the world won’t help you! You will be waking up multiple times a night for the next few months. Maybe even years! A pregnancy pillow, also called a maternity pillow, is a pillow that supports your body as you sleep on your side. You can’t sleep on your belly for obvious reasons and many people can’t sleep lying on their back. If you sleep on your side, your belly turns downwards and rests on the bed, creating even more pressure and discomfort. A pregnancy pillow comes in a variety of shapes and sizes, but they all provide the same benefit. To keep your belly from resting on the bed, and to keep you in a comfortable position so you don’t move around too much. A pregnancy pillow also provides some mental health. It feels good to snuggle up at night. Your partner needs to sleep and if you can’t get comfortable then snuggling up to them might not be an option. When you need that reassuring hug, your maternity pillow is there for you! Now let’s take a look at the recommendations of the best maternity pillow. For those that don’t want a huge pregnancy pillow that takes up too much space on an already crowded bed, consider this small “V” shaped one from John Lewis. If you have a simple wedge shaped one for your belly, but find that your neck is sore when waking up in the morning, you could use some support. Rest your head in the crook part of the V and the sides can be adjusted to keep you from moving too much. Not everybody needs a full body oversized pillow. Do you think it has a washable cover? Why, yes! It does! And the entire pillow is washable and small enough to fit into any sized machine. An added benefit to this pillow is that it makes an ideal nursing pillow. The Smart Snoogle Chic maternity pillow by LeachCo is one of the best selling in the world. It has an optional cover that zips easily over it for easy washing. The cover is 100% cotton and organic. Though they don’t exactly say what the filling is, it seems that it isn’t organic. When you are pregnant you will probably be hyper-aware of the materials that you use on a daily basis. Having an organic option for your pregnancy pillow cover will be appreciated by those who want to keep life as natural as possible. It’s a “C” shaped total body maternity cushion which is great for keeping your legs apart, your spine aligned and your belly resting comfortably on a medium firm cushion. For a very comfortable wedge maternity pillow, I recommend this one. The quilted cover gives a bit more cushion and comfort as well, as being removable and washable. Notice a trend here? Washable rates very highly in my book and you will see why when you are pregnant! Getting a replacement cover for a wedge pillow is also very easy to do since the shape is common and not proprietary like many of the total body pillows. If you find that cover not as comfortable as you like, simply get another one. The foam filling gives great support and is soft enough for your belly to rest comfortably upon it. It won’t compress and lose its effectiveness over time. This will stay firm long after the baby is born. Use it to prop your feet up to reduce swelling of the ankles, under your pillow to raise your head, under your belly or wedge it under your back to keep from turning over. Made from shredded memory foam and covered in bamboo fibre fabric this pillow is at the top of the list for comfort. You get the softness of down and the comfort of memory foam, only without the overheating usually associated with memory foam since the foam is flaked. Air is allowed to circulate around the foam, so you’re able to breathe and not end up in a pool of sweat. The pillowcase even has air vents to keep the air flowing. The cover is made of bamboo will eliminate the risk of dust mites and is hypo-allergenic. And, yes, I know you are asking, you can wash the pillowcase! You don’t just need support during your pregnancy, but comfort. I don’t mean comfort in a snuggly way. I mean it in the sense that you don’t want the price for your support to come with overheating or sneezing from allergens in your pillow. 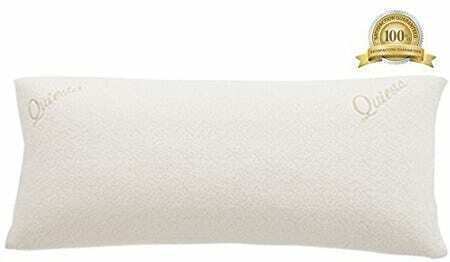 The Quiesta pillow is a simple, no-frills maternity pillow that will keep you comfortable and well rested. More of a “G” shape than a “C” shape, this total body maternity pillow has your whole body covered. The unique shape adds even more support to your belly as the little extra curve at the end slides right underneath it. End to end this is 60 inches long. Longer if you were to stretch it out and measure it as a whole. The cover is a very comfortable and breathable cotton. The filling, though a synthetic material, is latex, BPA and phthalate free. Right out of the bag, it does have a slightly chemical odour. I recommend letting it air out for at least a few hours before using it in bed. The filling is very firm, but still very flexible. The firmness is great for support and helping to keep you in place while you sleep. It’s flexible enough to wrap around your body almost like a giant Boa constrictor! A huge positive that makes it very easy to recommend, is that it has a removable cover that can be machine washed. That is something that should not be overlooked when considering a pregnancy pillow. Pregnancy pillows come in all shapes and sizes. Finding the best pregnancy pillow for you depends on how you sleep, and your budget, as they can get expensive. The wedge shaped pregnancy pillow is exactly what it sounds like. It is a pillow that is a wedge. Used on it’s own it goes right under the belly and lifts it off of the bed keeping your back aligned better and your baby resting peacefully. Used in conjunction with another pillow, it can be slid under your back, keeping your back in place and preventing you from rolling over too much during the night. You can even use it under your pillow to keep yourself elevated a bit. Heartburn sufferers can get some relief by doing this. They are usually the cheapest pregnancy pillow on the market. You have a lot of things that you will be spending money on to prepare for the baby. This is an economical option for many women. 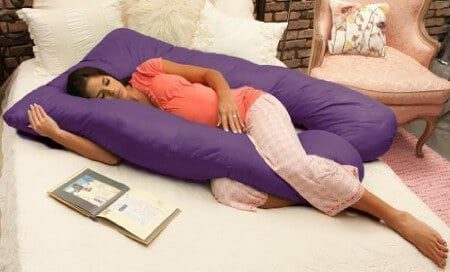 There might not be much enough space on your bed for a full body maternity pillow, so for many women, this is the only option. What’s also nice is that after you have the baby you will still be getting some use out of this pillow even if only to prop your head up using it underneath your pillow. These are also simply called body pillows as non pregnant people also like to use them. Feels good to hug it. Most women are looking for this type of pillow as they don’t want to have a bed full of different pillows for different parts of the body. The full length pregnancy pillow may take up a lot of space, but at least it is self-contained and you only need one. Another benefit is post pregnancy you will still like to use it, as it does provide a good night’s sleep even after your belly has disappeared. One looks like a regular pillow except really long. It’s great to get a good hug going with it, but it isn’t usually very flexible. The other is a flexible one and can really be moved around into different shapes. This is especially good as your body changes. What was comfortable yesterday may feel like torture today. It is nice having it cover different sleeping options. How you sleep with the full length pregnancy pillow is up to how you usually like to sleep. You can simply use it to hug and keep your belly off of the bed. Or, you can copy the fetal position of your baby and have the pillow go between your legs. The total body pregnancy pillow is like the Cadillac of pregnancy pillows. With the price tag to match in most cases. This maternity pillow is really big and it’s shape lends itself to whatever your sleeping style or body position is. There are two types of total body pregnancy pillow. One is shaped like a “C”. The “C” shape wraps almost all the way around your entire body. One end starts under your belly, goes down between your legs, up your back and finally wraps underneath your head. It offers total support for every part of your body. Wrapping it around you, it keeps your belly off of the bed, your legs apart to give comfort to your upper leg, your spine aligned and your head cozy. It also helps tremendously in keeping you from moving around too much. If you sleep in a fetal position, you will find yourself comfortably and tightly wrapped up into a nice package. C-shaped pillows are great for plus-sized women. They can wrap around the body without getting in the way and offer great support. The other looks more like a horseshoe or “U” shape. The “U” shape offers total support on both sides of your body. You start with your head on the closed side of the “U”. One side goes along your front with your belly propped up over it. The bottom then can go between your legs if you like, or, not depending on your preference. The other sides runs down along your back helping to keep you in place. The bottom of that side, again, can go between your legs if you like. Neither one is better or worse for your sleep. It really depends on how you like to sleep. What are maternity pillows filled with? The least expensive pregnancy pillows are usually filled with styrofoam balls. 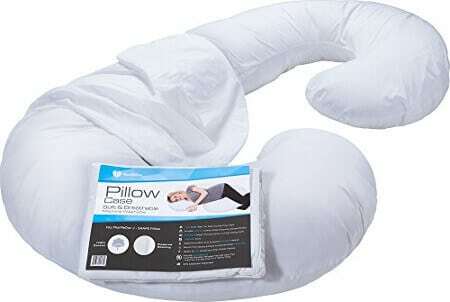 This filling will allow the pregnancy pillow to form to your body and can be very comfortable. The low cost comes with a price, though. They usually make a lot of noise when you move around. Polyester filling is another inexpensive option for filling a pillow. It also allows the pillow to form to your body and sleeping position, and doesn’t make any noise in the process. The potential negative is that they tend to make you sweat and it is not a natural material. Microbeads are tiny balls, even tinier than the styrofoam balls. They are roughly the same size as fine grain cous cous. The microbead filled pregnancy pillows are lightweight and make almost no sound. Since they are smaller than they styrofoam beads, they also form much better to your body and offer greater support. Memory foam is probably the best material to make comfortable pregnancy pillows. It takes the form of your body very precisely, but always bounces back to its original shape. Offering terrific support all the while. The negative aspect associated with anything made of memory foam is that they often lead to overheating. When you are pregnant, you often overheat without any help! Buckwheat husks offer a natural alternative to the synthetic materials in most pregnancy pillows. When you are pregnant you are usually hyper aware of any smell and have to stay away from synthetics as they almost always have a strong chemical smell. Buckwheat gives the same kind of support and flexibility as styrofoam filling. If you have allergies, you should look into natural fillings. Can pregnancy pillows be cleaned? Most maternity cushions are far too big to be put into a washer. Some, however, have a cover that can be removed and washed making your life easier. Usually, the manufacturer of the ones you are interested in will sell a cover separately. It is worth the extra investment as you will likely be sweating much more than normal during this period. Some of the standard full length pillows described earlier have cases that will fit and can easily be washed. If a cover is not available you will need to do some spot cleaning to keep it fresh. Q: Can I just use multiple pillows instead of a pregnancy pillow. A: Of course you can. Why would you want to? A regular pillow will not have the same support. Your pillows will end up all over the bed and that alone will probably keep you up at night. It’s worth the small investment to have a good pregnancy pillow that will offer support and a comfortable night’s sleep. Still think you don’t need a pregnancy pillow? Q: What is the difference between a body pillow and a pregnancy pillow? A: A body pillow could easily substitute a pregnancy pillow as long as it offers support. Many pregnant women prefer the simple style and smaller profile of the body pillow compared to a maternity pillow. Some women prefer the customizability of a pregnancy pillow that you can’t really get with a body pillow. Q: What are the benefits of using a pregnancy pillow? 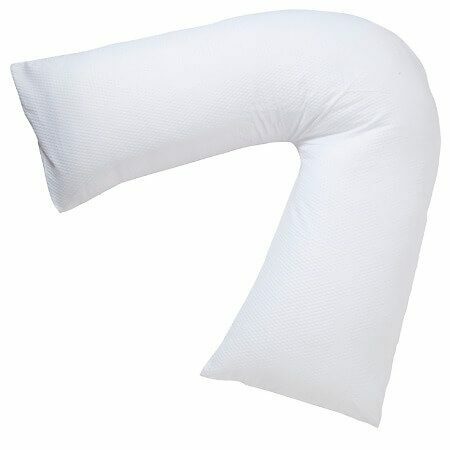 A: A pregnancy pillow provides support for the entire body. It alleviates the pain associated with a strained back, neck and legs. The ideal sleeping position when pregnant is the fetal position. A pregnancy pillow helps the pregnant woman to lie comfortably in that position. The legs stay apart easing the pressure on the hips as well as keeping them from getting too hot if they are one on top of the other. The belly is raised off of the bed relieving the pressure on the bladder. Q: When should I start using the pregnancy pillow? A: Anytime you are uncomfortable at night is a good time to start using it. You don’t even have to be pregnant to see the benefits of a pregnancy pillow. They offer back support and comfort. That can benefit anybody, not just pregnant women. That being said, by the time your belly is starting to show, you will probably begin having some aches and restless nights. You should probably have the pillow ready to go by that time. It’s no secret that many nights of sleep will be lost after the baby is born. Everybody knows that. It is what keeps some couples from even considering having a baby to begin with! What some people don’t expect is how much sleep is lost well before the baby is born. Anything that can get you completely rested before the days of perpetual half sleep is something that you should consider. Being pregnant is difficult. Why make it harder on yourself by not getting a proper maternity pillow? Did you find this guide useful? Know a pregnant woman complaining of no sleep and aches and pains? Share this article and help somebody get the rest they deserve! As a final note I have to admit pregnency matters are not my area of usual area expertise. Luckily a friend of mine who is much more qualified agreed to help me write this, so a big thank you there!